Each year the Arts & Business Council of Greater Nashville celebrates a Nashville resident for their inspiring leadership and patronage of the arts with its Martha Rivers Ingram Arts Visionary Award. 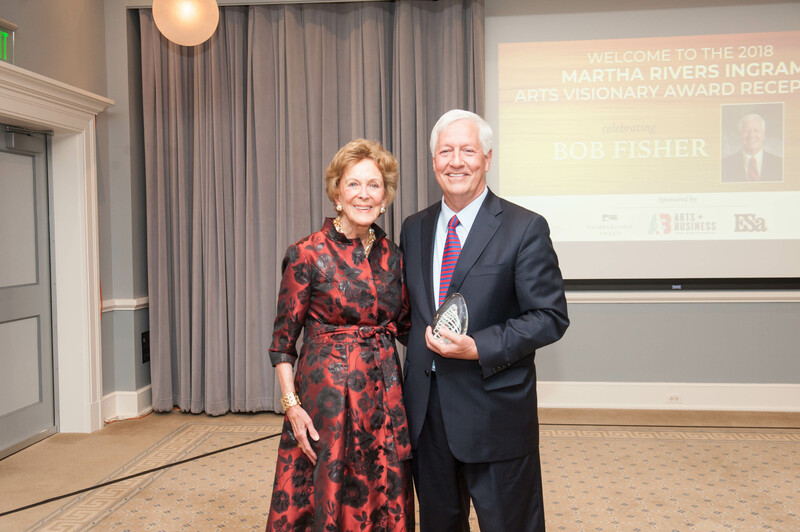 This year the organization presented the award to Belmont President Dr. Bob Fisher, a long-time Nashville business leader and arts supporter. Fisher’s friends, family and colleagues from his many business endeavors as well as his community and arts leadership activities gathered at Nashville’s Schermerhorn Symphony Center to honor his significant volunteer and community support work. The reception included a musical tribute from students of Belmont University’s Musical Theatre program and remarks from community leaders including Joseph “Pepe” Presley, David Minnigan, R. Milton Johnson, H. Beecher Hicks, III, Butch Spyridon, Ralph Schulz, Rick Byrd, Marty Dickens, and Matt Largen. The award was presented by Martha Ingram and 2016 honoree Steve Turner. Previous Ingram Arts Visionary Award winners include: Earl Swensson, Denny Bottorf, Walter Knestrick, Steve & Jay Turner, and Shirley Zeitlin. Corporate sponsors of this event include Earl Swensson Associates and Cumberland Trust.